The apartment is 275 sq. ft. It has a large walk in closet, a kitchenette in the main room with counter tops, cabinets, a microwave, a burner appliance and a refrigerator. It does not have a kitchen sink or stove. 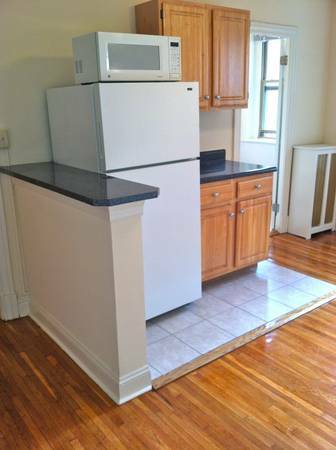 The apartment also has freshly refinished hardwood floors and large southern exposure windows overlooking downtown DC. The bathroom is a full bath with a beautiful claw foot tub. The apartment is perfect for someone who is a global traveler and needs a quiet place to rest between trips. It would also be a wonderful city residence for a part time Washingtonian or a first time apartment for someone who wants to live alone, but still live in the heart of the city. Constructed in 1926, the Hampton Courts has the elegant appeal of early 20th century architecture. The building is equipped with two elevators, a secure intercom entrance, and a laundry room with a card payment system. 2013 New Hampshire Ave. NW is a quiet one way street shaded by large oak trees. It is just steps away from the intersection of U St. and 16th St. NW. This studio is going for $1125 Utilities Included. Dear PoPville – What are you looking for in a Bakery?